Our Gatlinburg cabin rentals and chalet rentals are located behind the Gatlinburg TN Welcome Center off of Wiley Oakley Road. As you can see from our photos, our properties are a cut above the competition and of the highest quality. All our chalets are minutes to a trolley which will take you anywhere in Gatlinburg or Pigeon Forge for 50 cents. Its A GREAT DEAL. Just think, you wont even have to drive in our legendary traffic! Outback Village centrally located to all area attractions including Dollywood, Ripleys Aquarium of the Smokies, Ober Gatlinburg, Dixie Stampede, and numerous other attractions in our Great Smoky Mountains region. Our chalets & cabins are impeccably decorated with keen attention to detail, and offer all the amenities youd expect in a the most luxurious of mountain getaways. Most are equipped with hot tubs and/or Jacuzzis and many offer much more, including fireplaces, game rooms with pool tables and big screen TVs. 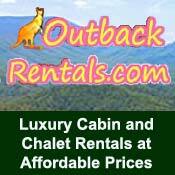 Now building authentic log cabins in Outback Village for investment property rental income. Choose your Gatlinburg lot for sale to build your log cabin or luxury mountain home today with onsite property rental management! All our properties are conveniently located in Chalet Village and Outback Village and only minutes from downtown Gatlinburg, Pigeon Forge, the Great Smoky Mountains National Park, Dollywood & Dollywoods Splash Country, horseback riding, golfing, snow skiing, & whitewater rafting.